Years ago it seems Walt Disney basically said all you need to know about my studio, as I am the only one who works in there (**wink-wink! ). It’s nothing too fancy, though I am fortunate to have this second bedroom which I can dedicate to my artwork. There are two drawing tables which I serve as either my cartooning or illustration work, depending on my needs. On the other side of the room (not shown) are my computers, scanners, storage drives, book shelves, etc. It’s a pleasant place where I can withdraw from the world, immerse myself in my artwork, embrace the peace that comes from creating, and swear like a garbage man when things don’t go my way or whenever I realize my life has not turned out like I had always dreamed it would. I’m a big fan of audio books and I can usually be found working while an unabridged favorite is playing. If not an audio book then I usually have movies or scientific specials about paleontology or astronomy playing in the background. 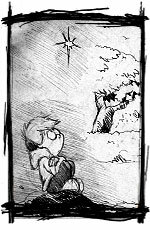 Perhaps you’ve noticed but I am a throwback to the old school style of cartooning — hand drawn. The reason for this is I feel drawing on the computer is a step removed from the actual human being doing the drawing. Every artist has the ability to create unique brush strokes but the computer removes this miracle. Yes, occasionally an artist’s style can still show through but it is but a shadow of their true potential. I feel there is danger in allowing software to crowd the true artist out of the picture. It’s just my opinion but that’s why all my graphics, comic strips, etc, are hand-drawn before Photoshop. For ideas I sit in coffee shops or bookstores and let gag ideas flow; often this happens just before bedtime too. Once I have the idea I start sketching panels on regular bond paper with a pencil. After I feel satisfied with the dialogue and composition I complete a final drawing on Strathmore Bristol Board (smooth), in pencil. 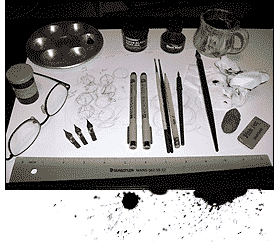 I ink with permanent black ink using a combination of brushes, pen nibs, and pens. After erasing the remaining pencil lines I scan the image and port it over to Photoshop. Dialogue is added and then the image is reduced for black and white presentation. If color is necessary then this is accomplished on the computer as well. Most of my materials are traditional, such as Windsor & Newton brushes, Speedball nibs, crowquill pens. Their roots are founded as far back as the Middle Ages for pen nibs, and 210 B.C. for the writing-brush. It’s not that I get sentimental about the history, it’s that these materials allow artists to display their unique abilities on paper. The computer is the new kid on the block and I am amazed at the creative dimensions it has extended beyond traditional paper.